If you are a supper person, this place needs no introduction. It's difficult to miss this buzzing restaurant (or eatery) along Jalan Besar because most of the time there's a huge crowd at the entrance waiting to be seated, even at the wee hours of the night. There's huge seating capacity both outside, as well as the inside but somehow it just isn't ever enough for the crowd. Expect to wait at least 15 - 30 minutes if you go during a Friday or Saturday night. I remember waiting for an hour before. But fact is, the food is good, and worth the wait. One of my favorite on the list to order is the Crispy Eggplant with Meat Floss, which is basically just deep fried eggplant with a whole load of meat floss on it. Simple as it sounds, the eggplant doesn't come off too oily even though it is deep fried. Instead, it comes off crispy and goes well with the meat floss. Another of my favorite (basically everything i order is my favorite) is the Prawn and Banana Fritter. These golden fried treasures are filled with aplenty of fresh prawns and ripen bananas, which surprisingly go well together, despite one being seafood and another a fruit. Again, i like how their fried stuff are not oily, which also means you feel less guilty after eating it. If you are a fan of vinegar, the Sichuan Chilli Oil Wanton is bound to suit your palate. The wantons, which are filled with pork meat, soaked in the goodness of the specially mixed vinegar and chilli oil sauce is simply delish. I always ask for more vinegar sauce when i order because they sometimes do not give enough. And yes, do not judge me because you will probably be doing the same if you ever try this. The Deep Fried Japanese Dumpling, which has spring onion, crab meat and mushroom in it, all in a crispy wanton skin also gets the thumbs up. I like how the ingredients in it go together very well. They serve it with what taste like Lea and Perrins sauce but i prefer it on its own. If you are not a fan of Dim Sum, they also serve up Sambal Kang Kong, which i do not find fantastic. I found the dish to be lacking sambal. Adding on to that, the sambal was spicy but lacked dry shrimps, which i feel are essentially important in this dish. I've tried better ones at zi char places and found this to be only passable. They also serve staples like Braised Beef La Mian. The soup of the la mian was very tasty and the beef brisket was especially tender. Of course, the noodles were also perfectly cooked (and handmade if i am not wrong). If you prefer something dry, go for their Plain Noodle in Onion and Oil. No doubt it is simple, it goes well with the Sichuan Chilli Oil Wanton. It is a tradition to end off my meal at Swee Choon with their signature Salted Egg Yolk Custard Bun. I do not exaggerate stuff but this one beats a lot of other reputable dim sum restaurants hands down. Soft and warm buns filled with oozing custard flowing out of the inside. They come in a basket of three but three never seems to be enough for me. 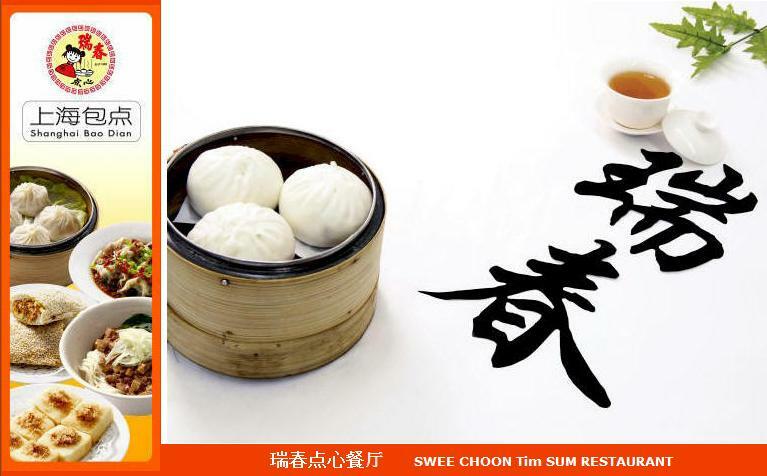 I love how Swee Choon serves up affordable quality dim sum, especially till the late hours of the night. This also means that there's a place to settle your chinese food craving if you get hungry for no apparent reason. However, do note that they do not take reservations and are closed on Tuesdays.